On June 6, 2006, a new holiday was born in commemoration of the 6/6/6 of the date. Inspired by the American political movement National Day of Prayer, this new holiday was dedicated to the most extreme of metal and was called the “National Day of Slayer.” Since others outside the USA wanted to participate, it soon became the Inter-National Day of Slayer, and has been celebrated enthusiastically every year since. This year, sobering news hit: On May 2, 2013, founding guitarist and major songwriter Jeff Hanneman of Slayer died from arachnid-induced liver failure. While Slayer re-camps and tries to figure out this situation, the International Day of Slayer team decided to recognize the obvious: Slayer is an emblem of metal just like metal is a symbol for not letting your sense of reality get stolen away by social pressures. 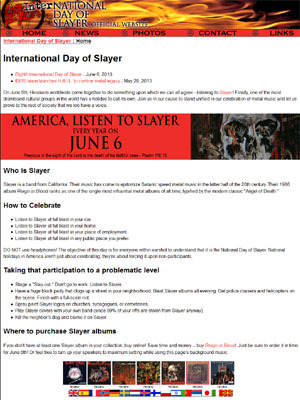 As a result, the team re-dedicated the International Day of Slayer as a generalized heavy metal holiday, focused on Slayer as a symbol. In addition, the same group is launching a new project called the Hessian Association for Identity Legislation (H.A.I.L.) whose goal is to get heavy metal recognized as a legitimate cultural group much like most religions, ethnicities, lifestyle choices and national cultures. We are metalheads, and we are legion worldwide, and we are a culture separate from both the mainstream and the counter-stream. We are going our own way… the most intense way, the way of reality and the way of METAL! “Hessian” is old-school California thrasher slang for headbangers, metalheads, metal fans, threshers, heshers, etc. It’s derived from the Hessian mercenaries who came over to fight for the British during the Revolutionary War and were both feared and known for their long hair and wild eyed combat tactics. Someone — probably a cynical history teacher — saw the similarity and the name has stuck ever since. Check out the H.A.I.L. website at www.hailmetal.org and visit the International Day of Slayer while you’re at it. Keep the horns high and the celebration loud, and we could have our own Hessian nation spread out across the globe in no time at all. I wasn’t old enough to have figured it out at the time, but according to this entertaining report, Steve Wozniak of Apple fame cobbled together a festival in 1983 whose goal was to showcase new styles of music, and in the process, showcased metal blowing away the willowy music of the previous ten years. This isn’t to say I dislike New Wave or any of those other styles. They have their place. But in 1983, metal was raging to take over. The Cold War was in full nuclear terror of instant radioactive death, the world was unstable and conservative, and as a result most people were getting ready to go into full kumbaya mode. Metal to the rescue, with warfare, doom, death, disease, horror and hedonism! 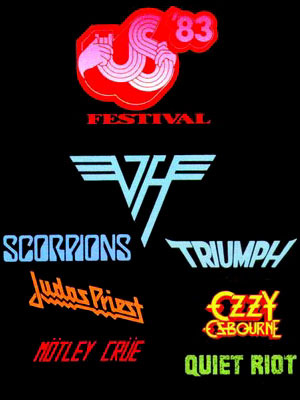 Heavy Metal Day featured Judas Priest, Van Halen, Triumph, Motley Crue, Quiet Riot, Scorpions and Ozzy Osbourne raging across a massive stage with spectacular amplification. In short, it was the MTV metal of the day, or the stuff you’d see on the then-new invention of MTV with its music video channels, and that meant it wasn’t as extreme as what we have now, but for then, it was like a giant backlash against the gradual creeping “love will save us” mentality of 1970s music. With metal, war was back, and it was angry! The ever-pointed Vine Neil of Motley Crue told one reporter that the significance of Heavy Metal Day was that “It was the day new wave died and rock ‘n’ roll took over.” 670,000 people attended the event, but over half of them came for Heavy Metal Day alone. The power of metal was established, and would only rise from this point onward as the world waited for the wavebreak of Slayer, Metallica, Bathory, and Hellhammer which was about to come crashing down about its ears. Perhaps May 29 should be remembered as the day metal rose up in power and struck down the opposition to assert itself.